We figure this home must have been abandoned before this renovation. 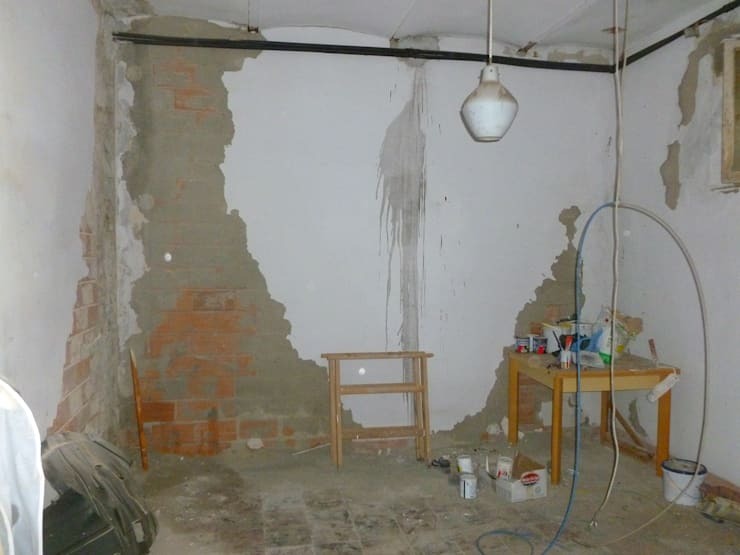 It was falling apart, with fragments of tile on the floors and walls that were ripped apart. Not only did the impeccable renovation by architects MC2 add modern beauty to the home, they added some fun details that give the home a vibrant personality. Overall, the home became a bright and modern space that would make any homeowner proud. Let's take a look at the architect's process as they turned this frustrating space into a home filled with fun. 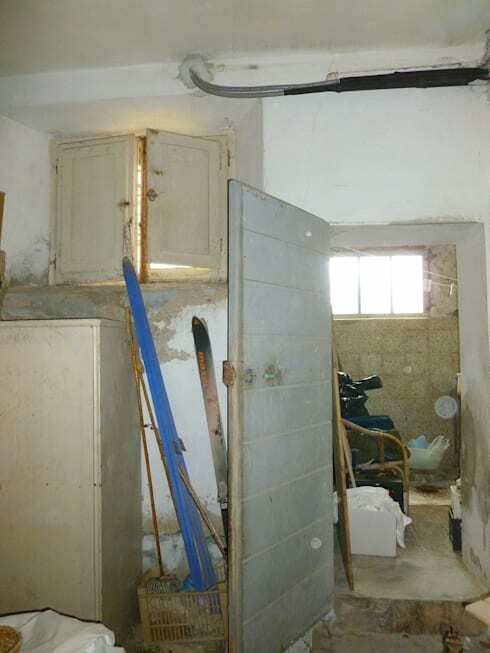 From the crusty kitchen cabinet to the filthy bathroom tile, this house needed a major clean. Never mind that the top of the drywall is peeling off! This home has been restored to a clean and organized state! The cupboards, the drywall, even the door to the bathroom have all been replaced with refreshing white options. The kitchen looks spacious and bright now, especially because its framed by that gorgeous arch-way. That arch helps to bring in some elegance to the space. 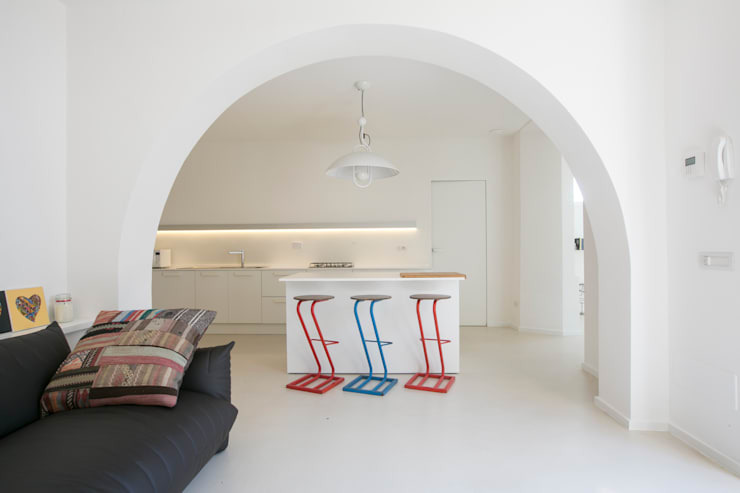 The stools add some personality too, but they feel more quirky than elegant in their bright colours and wavy design. This laundry room is just painful. The concrete is old and unappealing, and the drywall seems to have grown a mold infestation above the doorway! 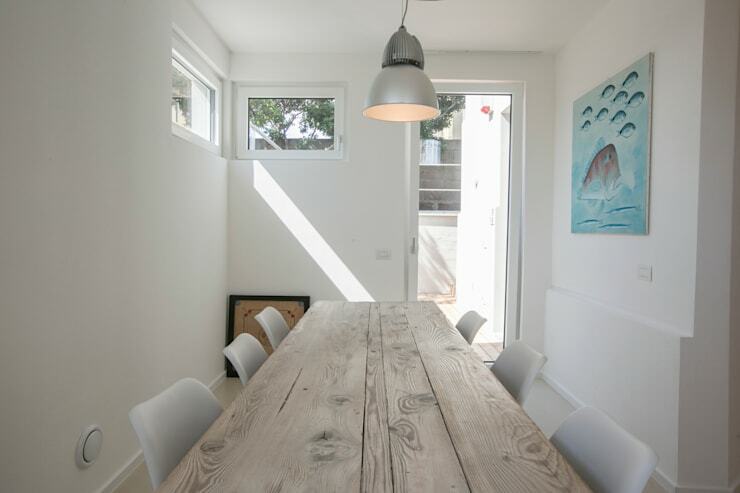 The architects changed the focus of this room from laundry to dining area. It's a perfectly enclosed space that feels private, but the two little windows bring in some light, while the back door can be opened to encourage a breeze to flow through the space. The decor has been kept light and minimalist, with only the blue wall painting to add colour. This clever change of function has made for a very convenient dining room. 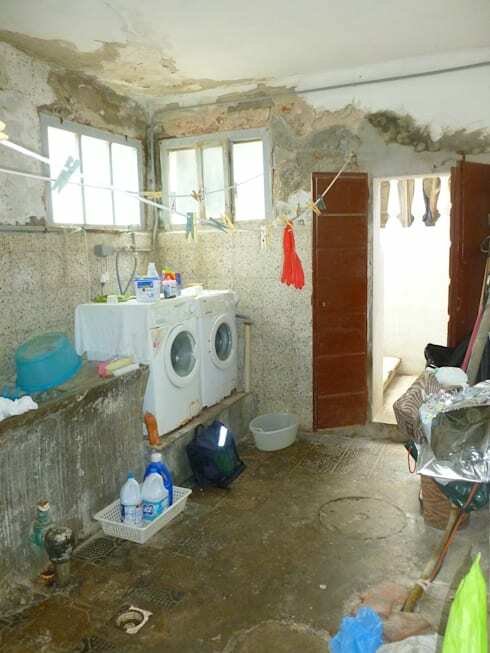 The owners must be pleased they hired architects that could see the laundry room's potential! Any function this room once had has completely vanished. The floor is uneven, the wall is covered in some kind of spill, and there's some exposed piping along the ceiling that looks troubling instead of stylish. This basement continues to surprise us with its bright and clean style. The large simple lights in the back of the room do wonders as far as light goes. The room has been kept in a simple minimalist palette of black and white, but comfort was not overlooked! That huge couch looks plump and soft, and the convenient shelf beside it makes for one comfortable spot to relax. This simple bathroom is full of textures in grey tones. The dark and tall shower looks luxurious. 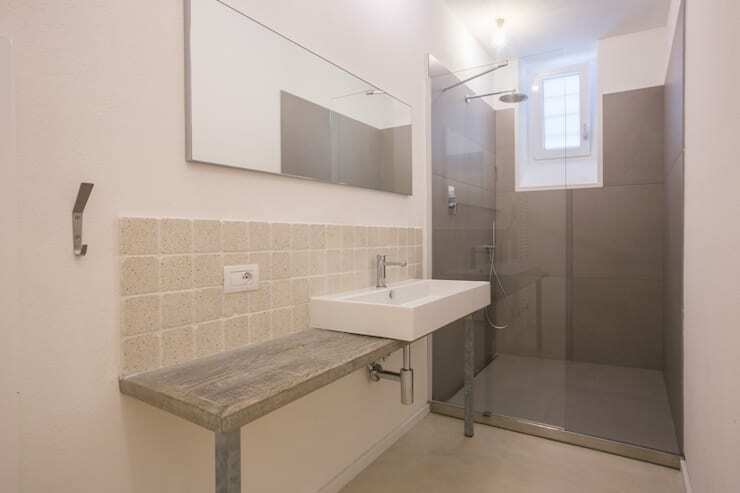 The contrast between the soft wooden counter and the rough stone wall adds visual interest to the space. All this bathroom needs is a little bit of colour! If you bathroom feels this bare, check out our gallery of beautiful bathrooms to get some inspiration. This simple bedroom is as textured and minimal as the bath. The grey-green covers have a stubbly texture that contrasts nicely with the flowing curtains in the same shade. Much like in the living room, the floating shelves on either side of the bed eliminate the need for side tables and make the room feel balanced and unique. In this room there is a pop of colour in the form of the red candles that add a little romance to the space. 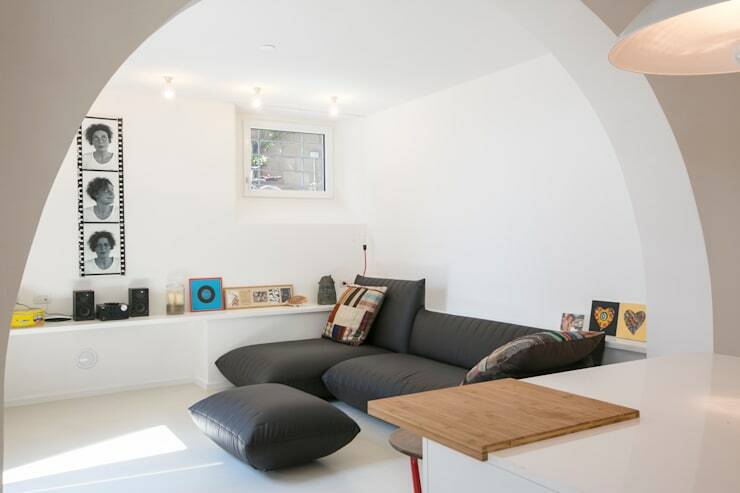 For some, this quirky and bright space hits just the right minimalist note. While no one would dispute that this space is a huge improvement on the ruins it began as, some may feel that warmth is still lacking. If you agree, this light cedar house might be just the home for you! Did this renovation work for you? Why or why not? Let us know in the comments!